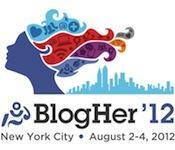 This year, OurKidsMom would like to attend the BlogHer ’12 Conference in New York, and I couldn’t be more excited! BlogHer is an annual blogging conference that "will bring over three thousand attendees together from all over the world to share hands-on learning, rich discussions, opportunities to meet with the brands that support them and plentiful networking opportunities." This is a fantastic opportunity to turn those social media networking connections into real life, face-to-face connections in an environment created to foster those connections. Awesome. What I need now is a sponsor (or two). For reasons why your company should sponsor OurKidsMom and our current stats, please visit this page. Apparel branding – I will wear your brand logo for the entire conference. Business Card Space – Your brand logo and information will be printed on the back of my OKM business cards that I will hand out to interested parties. Advertising Space – 1 premium ad placement on OurKidsMom for 1 full calendar year, plus 1 300×250 ad in each article posted during the BlogHer ’12 conference. Tweets – At least 2 tweets per day with a link & mention of your brand during the BlogHer ’12 Weekend, along with a #FollowFriday tweet. Facebook Updates – At least 1 status update per day with a link & mention of your brand on OKM Facebook page during the BlogHer ’12 Weekend. That’s a lot of great promotion! Apparel branding – I will wear your brand logo for the part of the conference. Advertising Space – 1 premium ad placement on OurKidsMom for 6 months. Tweets – At least 1 tweet per day with a link & mention of your brand during the BlogHer ’12 Weekend, along with a #FollowFriday tweet. Interested? GREAT! It’s easy to contact me… Just send an email to Heather: heather @ ourkidsmom dot com and we can talk.